Annie-Maree from EyeSpy Creations made her first quilt in 2004 and never looked back. Recently, she launched her new business EyeSpy Creations and for her debut quilt pattern, Annie-Maree has created a wonderful indigenous eye spy quilt, showcasing eighteen Australian florae and faunae prints, solids and indigenous inspired fabrics. Kits to make this wonderful quilt can be purchased from her website http://www.eyespycreations.com.au/. Included in the kit is fabric for the quilt top and binding with a set of easy and very comprehensive instructions to make the quilt. 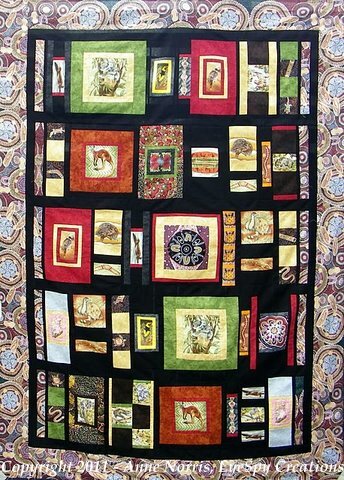 This quilt would make a lovely gift for children and adults alike. To celebrate the debut of this exquisite quilt, Annie-Maree will be giving away a selection of indigenous prints. To enter, please leave a comment on this post telling me what your favourite Australian native animal is and which one you would hate to meet? I love the pale faced rosellas that nest in our yard and shiver at the thought of seeing a red back spider. This giveaway is open to everyone no matter where you live. Don’t forget to leave me a way of contacting you. Giveaway ends May 31st 2011. That is a lovely quilt and fabulous prints. I love Mr Roo and of course Koalas… how can anyone not love these cute little critters? My favourite animal is quokka – it's such a great name and I would hate to meet a crocodile! Thanks for the chance. I love Whip Birds, we have them right near our house and the noise they make as a pair is awesome. I dread the thought of coming across a snake, any snake! I'd have to choose the koala because I had a toy one as a child but I don't think they're as cuddly as they look! and as I've never visited Australia I'd love to see everything if I was lucky enough to visit one day!! My favorite is the koala. I'm not familiar enough with Australian animals to list one I would hate to meet. Thanks for the opportunity to enter you giveaway. I am very ignorant about Australian natives but I think it would be the kangaroo! I find them fascinating! Oh what pretty fabrics. Thanks for the chance to win them. I love all of your native birds that are wild there and sold here in the U.S..
the one I would hate to meet is that spider that is big enough to eat a bird. The quilt is wonderful. I think the parrot is lovely.. and the bandicoot.. not so much..
That is one awesome quilt. I don't know much about Australian animals but everyone knows koala bears are soooo cute so I wouldn't mind a hug from one of them. And I've heard of Tasmanian Devils & they sound awful so wouln't want to meet one of those! Thanks for the chance to win some lovely fabric. I would love to meet all the wondrous birds of Australia. Going there is on my bucket list. The animal(s) I would hate to meet up with are any on the snakes.Those aren't cool! Her quilt is absolutely beautiful….the one she is holding and the eye-spy quilt. 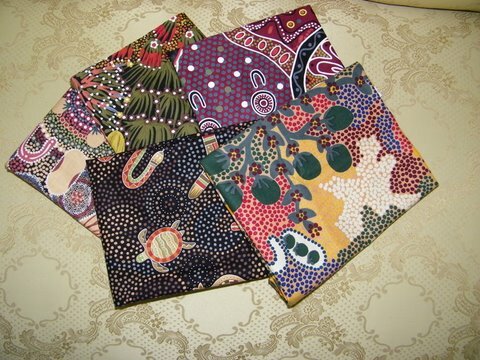 I'm a lover of the AU fabrics….they stir the wild in me…LOL. The animial I would least like to met is the Kultarr….the thought of a jumping mouse freaks me out. Since I've had the extreme pleasure of visiting the Zoo in Brisbane….I've already been exposed to the beautiful Kangaroo's and the Koalas…and I also got to feed an elephant. That zoo is one of the best in the world. Thanks for the chance….I'm very excited just to be entered. I love kangeroos — they are fascinating, with their pouches to hold their young! At the same time that I love to see pictures of kangeroos, I would be scared to death to meet one! The fabrics are lovely! I am fairly anti-spiders. As in I go screaming away from them. What a fabulous quilt. My favourite native animal is the wombat. I've been lucky enough to pat a couple and they are very cheeky and lovable. Any snake would be really scary especially a tiger snake as there are lots where I live and I always worry that my naughty little dogs will chase one. I would love to see the tiny turtles. I do not know if they have a specific name. I am not sure which animal I would not want to see, but I would not want to be too close to a Kangaroo. LOVE the roo, dislike the slitheries. I love our native animals, how lucky are we Aussies to have such unique creatures in our country? I would pick the much maligned dingo, I think they are beautiful. Would not like to meet up with a funnel web spider though. I love koala bears even though Iv'e never seen one. Love the quilt and fabrics. Hmmm don't know that I have a favourite animal or bird, blue wrens are pretty and I loathe those legless lizards. Got pretty close to one in The Grampians once and that was enough. Think I'd like to meet an Emu, but I would not like to meet a croc. Don't want to get close to widow makers either…not an animal, but dangerous none the less. I would love to meet a kangaroo (but not the kind that would be grouchy and kick me) and I would shudder to meet a crocodile. FAbulous giveaway! Lovely fabrics… I have never met any Australian animals and would love to be acquainted with them all, except perhaps for the box jellyfish. The echidna definitely appeals though. The quilts are so bold & beautiful! You're very talented! I'd love to meet up with a koala, they are just sooo sweet!! I used to have a stuffed animal koaa when i was a kid that i loved to its! As for which I'd like to avoid, definitely snakes! Eek! That is such a beautiful quilt. I just love the colors in it. My favorite animal from Austrailia would be the koala. And I would not like to meet a crocodile. I think Koalas are Cute and like kangaroos too. After reading your and others comments may be I'd hate to meet a snake or a deadly spider! When I was a child, Australia was the place in the world that most interested me. I did a massive school project on it … long before the internet … and ordered travel brochures from Australia to use for pictures that populated my report. I used wheat under a felt map of Australia on the cover of my report to show the topography of the Snowy Mountains. But … I'm so far from Australia that I still have never been there. *sad sigh*. I've had a long fascination with the animals as well but perhaps find the platypus particularly interesting. I love the designs on these fabrics. Beautiful! This is not a sneaky attempt at a second entry – please discount it for that – but I forgot to include part II of your question in my comment. Snakes and spiders in general. Frightening! *shudder* If I recall correctly, Australia has more poisonous spiders and snakes than anywhere else in the world. I'd be a nervous to sleep in a tent. i'd love a chance to win but simply cannot choose just one . . . the whole of Australia is bursting with awesome and unique fauna (and flora) and i would love to see them all. i suppose there are some that one might want to keep a distance from but i'm curious about even those~! i hope my inability to choose doesn't exclude me from the give-away . . .
Like the koala, would hate to meet any of the many poisonous spiders! I am not real familiar with Australian critters. I suppose of the ones I know I like the Koala the best and really wouldn't want to meet up with a Dingo. I love the quilt and fabrics on the top of this blog post. I am sure I would love to see a koala but I would not like to meet a crocodile or red spider. What great fabrics- I have never been to the land down under but I have always wanted to visit your beautiful country- Perhaps some day I will get the chance. My proper name is Anna Marie so your name caught my eye. Thanks for having such a terrific giveaway. I teach in a school that offers Cree as a second language. Over 90 percent of our students are First Nations or Metis descent. My brother and SIL are on a dream vacation to Australia right now – I'd love to win some Aussie fabric to make them a little something something – thank you for a lovely giveaway! I love koalas, but kangaroos worry me – I hear they have a mighty kick! What a gorgeous quilt! Those prints are amazing! I have always wanted to get real close to a Koala. I have no interest in getting close to spiders, snakes, lizards or anything similar. Kangaroo is favorite and crocodiles and spiders are not! Thanks for the lovely giveaway opportunity. The fabrics are wonderful. Koala is my favorite Austr. animal. The ones I would not want to meet are snakes and crocodiles. Thanks for the giveaway. Your quilt is soooo lovely. I think there are lots of answers that match mine, but here goes: I would love to see a koala and not the feared crocodile. I love a kangaroo. And I hate to meet a snake. Thanks for the chance to win! My e-mail is in my blog profile. That quilt is beautiful.I love to see all our native animals but I particularly love hearing the Kookaburra. It sends shivers up my spine. I love that laugh. have met some snakes in my day and I fear meeting them again. Hello.. my most favourite is the echidna…. but please may I not meet an Irukandji jellyfish in the water…..
My favorite is wallaby and I hate to see dugong. I like the parrot& kangeroos and also koalas & I wouldn't what to meet up with a snakes or crocodiles. I love the "Eyespy Creation Giveaway"! Love the quilt! you can count me in on this! I like all the animals in the quilt. Won't what to meet up with a snake or a crocodile. you contact me threw bea@theknottystitchers.com thank-you for a chance on this great giveaway! My favorite Australian animals are Kanga and Roo from Winnie the Pooh…the live versions are sweet from afar, who knows about up close? I don't have any idea which animal I'd hate to meet. Are there wild boars in Australia? If so, they'd probably top my list. Thanks for the giveaway. If I were to win, I know what I'd do with this great fabric. So many cute Aussie animals to choose from but I love bilbies and rainbow lorrikeets. We use to feed the lorrikeets on our verandah – so beautiful! I just love the Koalas. They look like teddy bears and look so loveable and cuddly. Thanks for the chance to win some unique fabrics. This is an easy one for me. I love the koalas and of course the kangaroos, and my biggest fear, is a BIG spider or snake. I don't care for either. I love your Eye Spy quilt. I have made a few lap quilts, and so want to try a bed quilt. You have definitely inspired me sweet friend. Lovely quilt! Thanks for the giveaway! I would prefer to see the whales and penguins. I would hate to see a snake of any kind! I really like the Parrots but please no snakes-yikes. Cool giveaway from someone half way across the world. Thanks. Koalas I suppose but I'd really like to visit and decide for myself! but no spiders please! The Koala bear I like very much, it is so cute to see how it acts in the trees. I would be afraid meeting a "friendly" big Ara parrot waving its wings around my head. Thanks for letting me participate to get a chance for these lovely prints. A baby Kangeroo would be nice to meet but I do not want to meet a crocodile! Thanks for the giveaway as the fabrics are gorgeous.